Son of Arthur Hughes De Wind, CE, and Margaret Jane De Wind, Edmund was born in Comber on 11 December 1883. 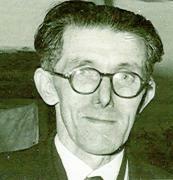 He attended Campbell College and joined the Bank of Ireland as a clerk in Cavan. He then emigrated to Canada to the Bank of Commerce. He had enlisted with the Canadian Expeditionery Force in 1914, serving at the Somme, St-Eloi and Ypres. He later received a Commission with the Royal Irish Rifles in the 15th (Service) Battalion and took part in the battles at Thiepval (1st July 1916), Messines Ridge (1917), the third Battle of Ypres (1917), Cambrai (1917) and the great German attack in 1918. 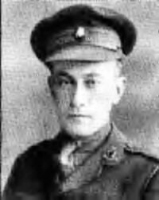 For most conspicuous bravery and self-sacrifice on the 1st March, 1918, at the Race Course Redoubt, near Groagie, France, For seven hours he held this most important post, and though twice wounded and practically single-handed, he maintained his position until another section could be got to his help. an two occasions, with two NCO's only, he got out on top under heavy machine gun and rifle fire, and cleared the enemy out of the trench, killing many. He continued to repel attack after attack until he vvas mortally wounded and collapsed. His valour, self sacrifice and example were of the highest order. He was posthumously awarded the Victoria Cross. His Victoria Cross, presented to his mother by King George V, was one of three gained by his regiment during the Great War. He has no known grave and is commemorated on the Pozieres Memorial to the Missing. In Comber there is a street named after him and in Canada there is a mountain named 'Mount de Wind' in Alberta. A tablet to his memory can be found in Comber Parish Church. After the War a large German gun was presented to the town as a memorial to him and was placed in the Square. During the Second World War the gun was removed for scrap metal to aid the production of munitions. However, metal plates from the side of the gun containing an inscription were preserved and are now in the porch of the Parish Church in the Square. In March 2017 the Edmond de Wind Centenary Committee announced a major series of events in memory of the VC winner, to culminate in the unveiling in March 2018 of a dedicated memorial plinth. There is already an Ulster History Circle blue plaque in his honour located at Bridge Street Link in Comber and unveiled in 2007..